When: August 15-20, 2017 (5 walking days). 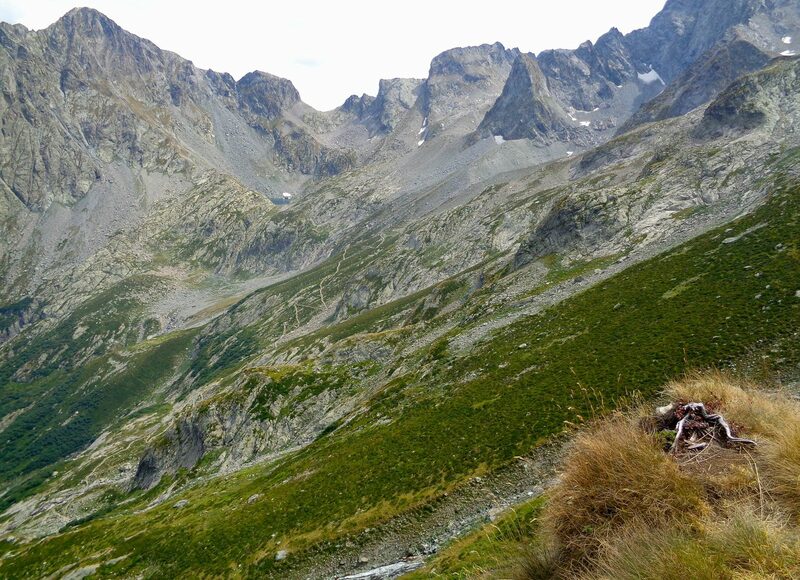 Highlights: a short, easy, scenic, free-form trip designed to fill a spare week. 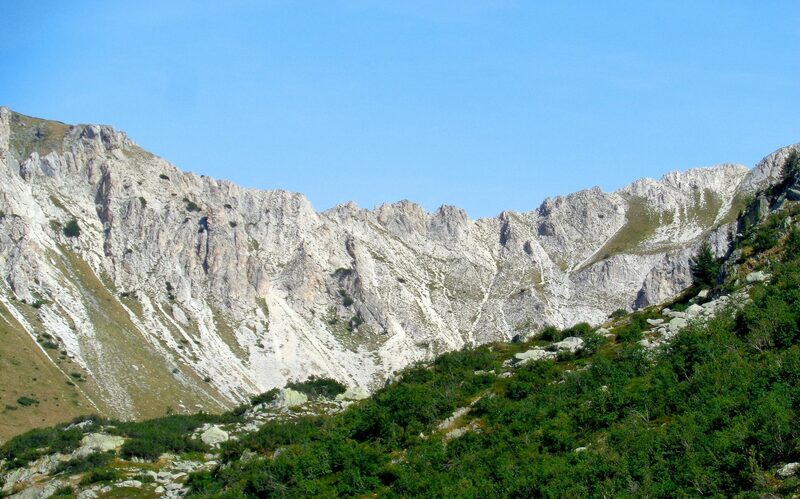 The Maritime Alps wiki page. French IGN 1:50000 Mercantour & Alpe-Maritime map. Click map to open an interactive CalTopo map in a new browser tab. Instructions for using CalTopo. The red line is our track; the yellow line is the international border. 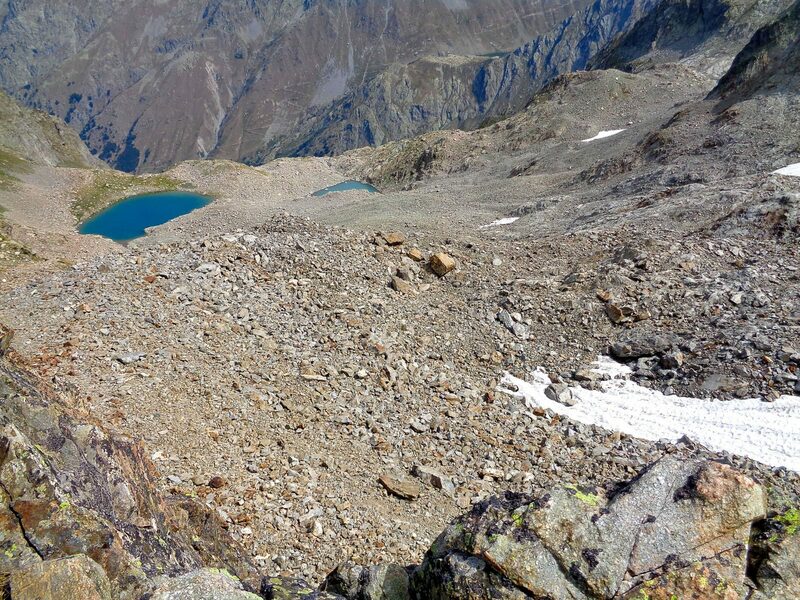 In August 2017, we completed a thru-hike of the Grande Traversata delle Alpi (GTA). The walk ended in the coastal town of Ventimiglia, Italy with a week left before our flight home. 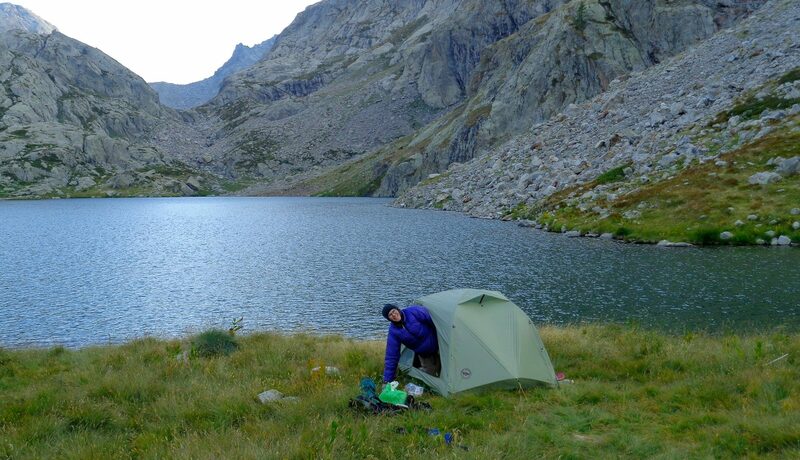 As in all of our foreign backpacking trips, we had allotted some additional days in our schedule in case our primary hike took longer than expected. Ventimiglia was not appealing to us and we got out of town as quickly as possible. It was very hot, crowded, and was a sprawl of coastal holiday homes. The local campground was a disaster, and all accommodations were booked. 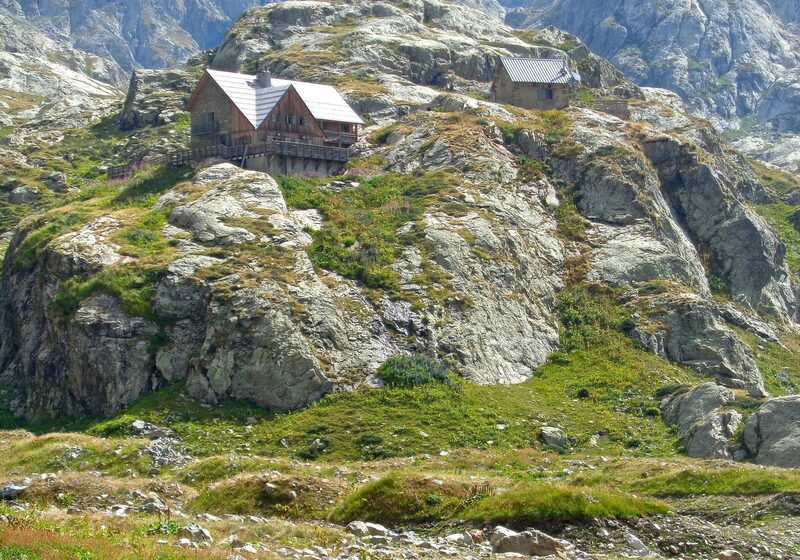 Having just spent 41 days in the mountains, the place was an unpleasant culture shock. 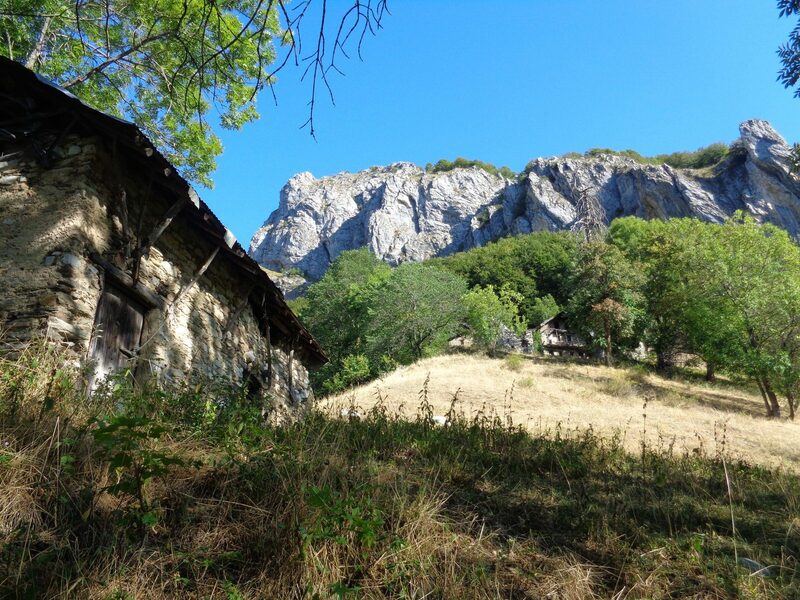 Knowing that we would likely finish the GTA with time to spare, prior to leaving home James had marked the location of all the train stations that serve the Maritime Alps region, and had mapped some possible hiking routes. 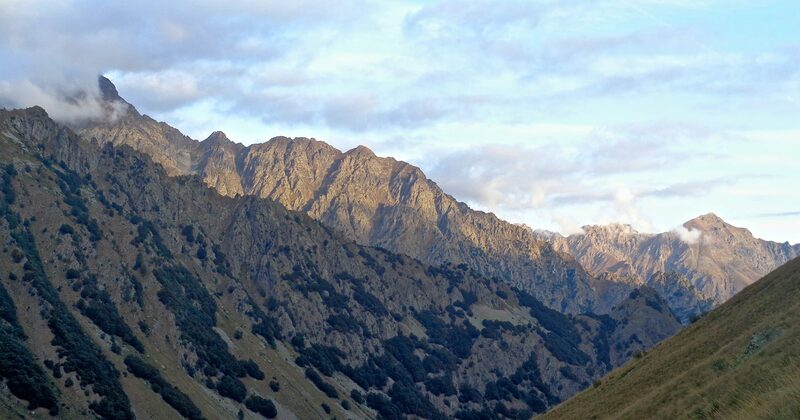 We decided the best option was to immediately leave the coastal region and head back into the mountains, so we took the train to the head of the nearest valley that provided access to the mountains, and started our post-GTA walk there. 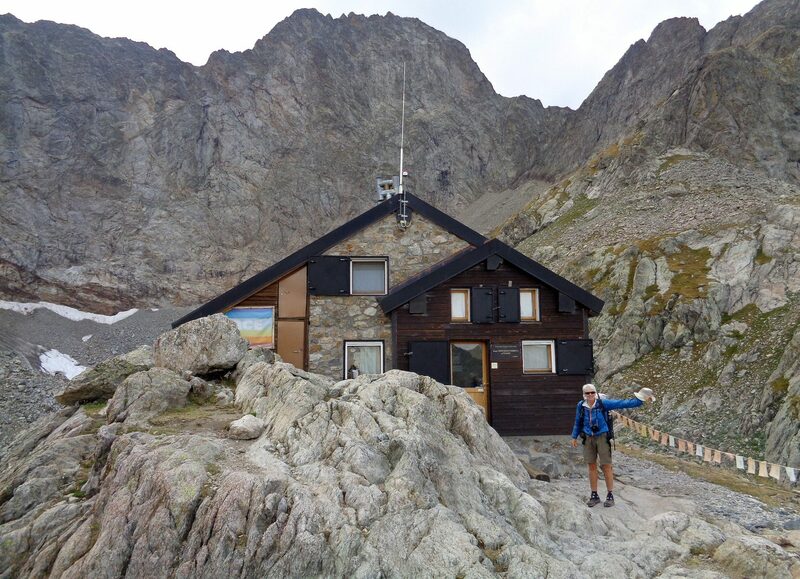 As it turned out, we did not follow any of his mapped itineraries, but instead made up a route as we travelled that would allow us to spend the week in the mountains and drop down to a train station in time to return to Milan for our flight home. 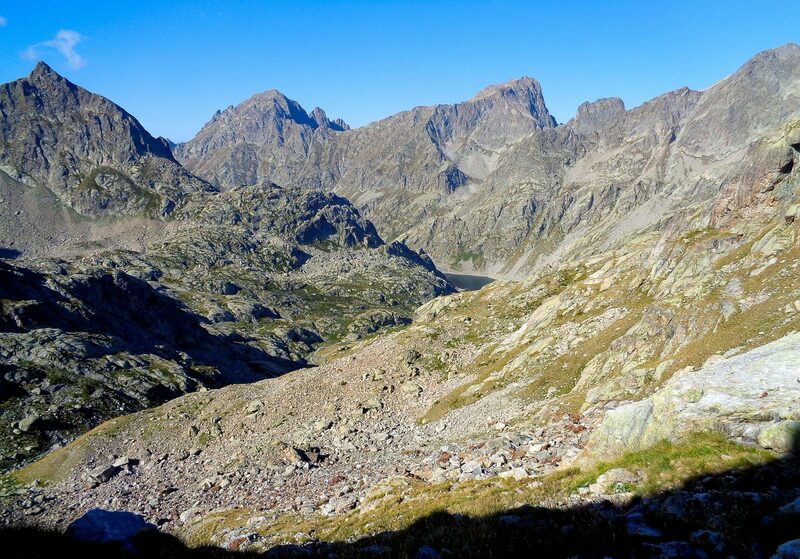 I enjoyed our little post-GTA hike in the Maritime Alps. We had good weather, good scenery, and some fine pieces of trail. The thing I liked most of all is how easy it was to take a train to an access point and start walking without committing to a full plan in advance. This route was a very nice way to wind down from the GTA. 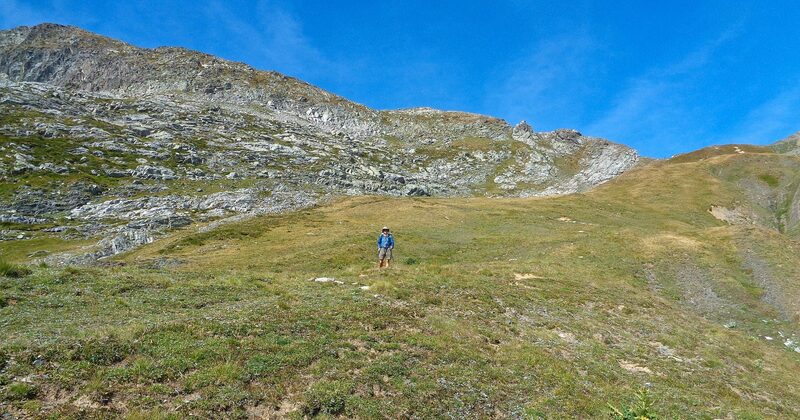 The mountains felt big and interesting and we got to cross the range from the southern foothills to the northern foothills, giving us a nice sense of how the range is put together. 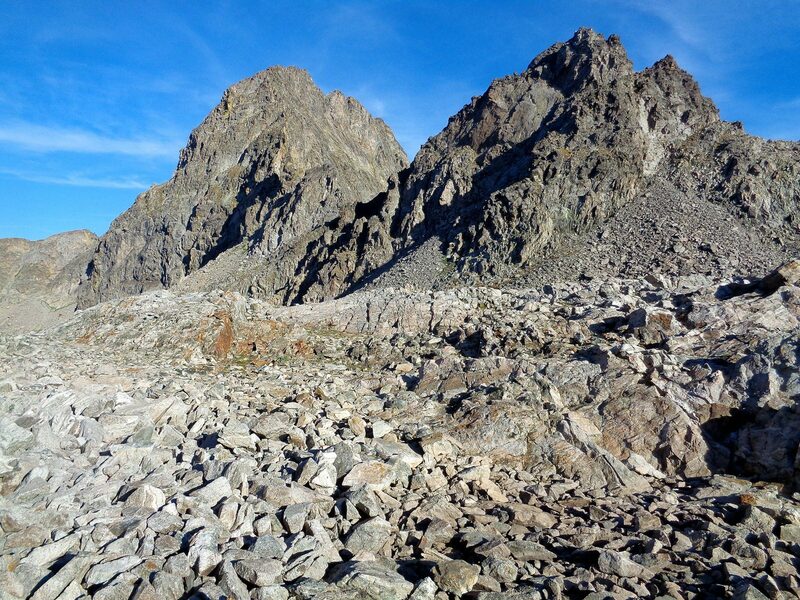 We walked through some high alpine areas that were more rugged than the bulk of the GTA, particularly crossing the Pas de la Fous, which was reminiscent of a lot of the off trail hiking we have done in the Sierra Nevada. By the time we completed this post-GTA walk, I felt it was time to go home and I had no regrets leaving the mountains. 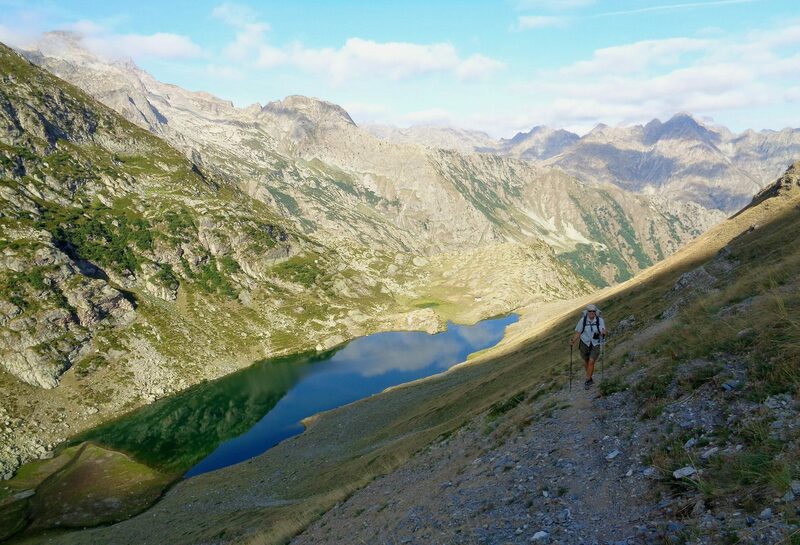 Please see our GTA trip report for more detailed information about hiking in this region of the Alps. Most of the notes apply to this walk as well. 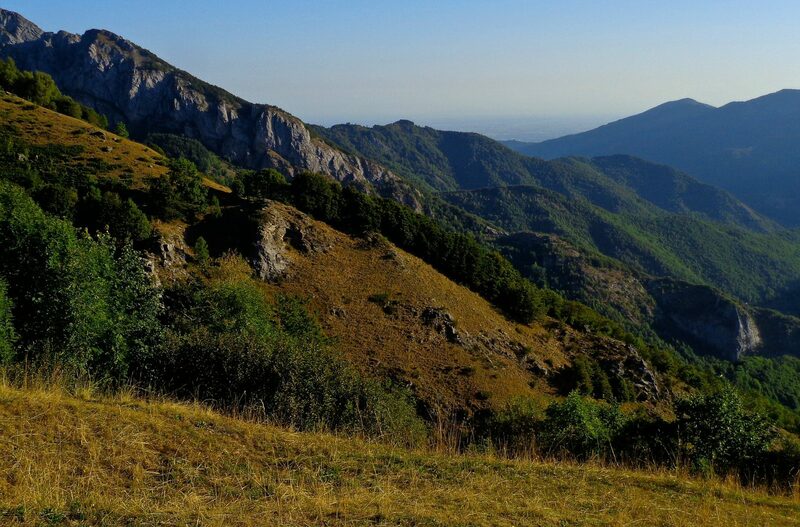 The Maritime Alps are a mountain range along the border between France and Italy, immediately north of the Mediterranean Sea. 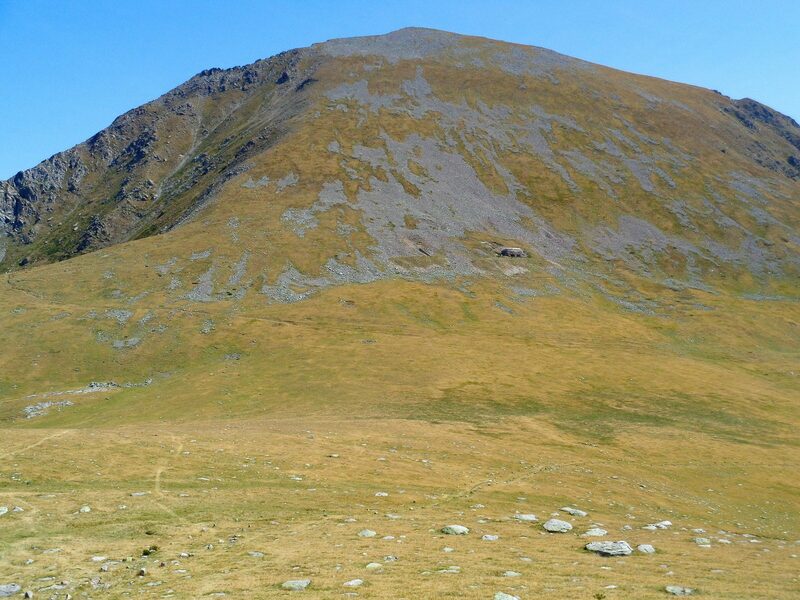 There are several peaks over 3000 meters in height; Monte Argentera in Italy at 3297 meters is the highest. 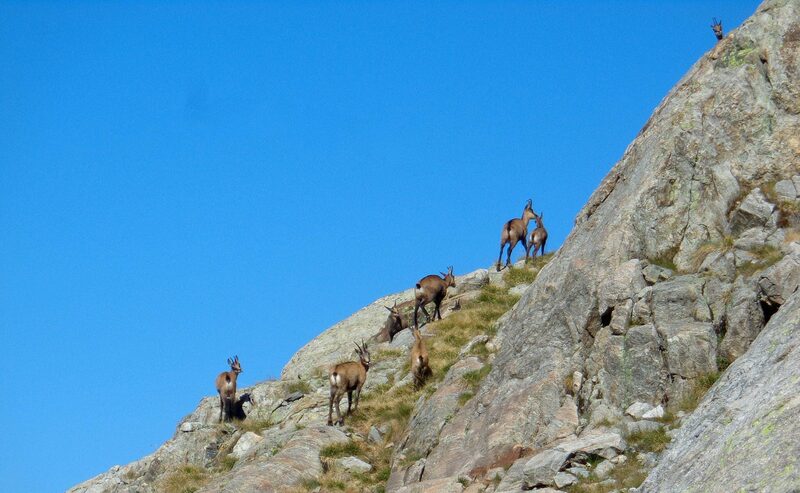 Within the region are the French Mercantour National Park and the Italian Parco Natural della Alpi Maritime. 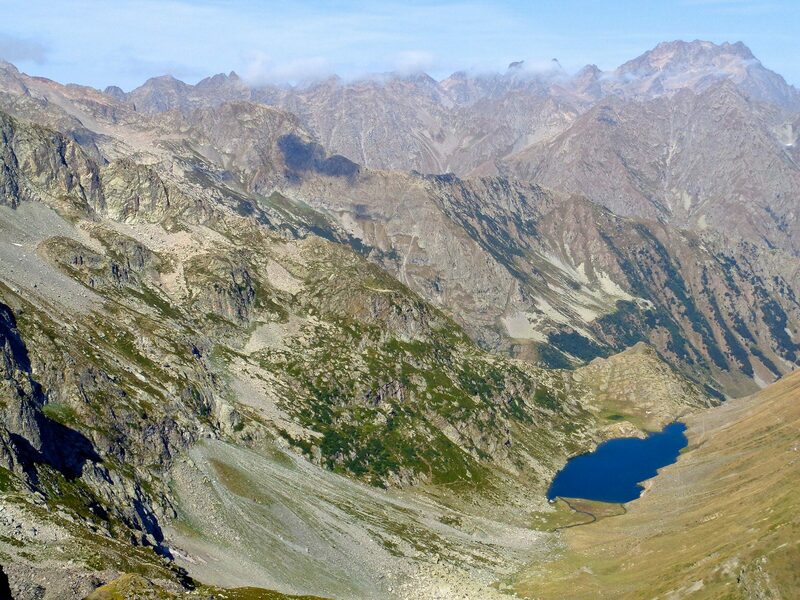 The peaks and ridges rise steeply above deep valleys. There are a few lakes, mostly man made. 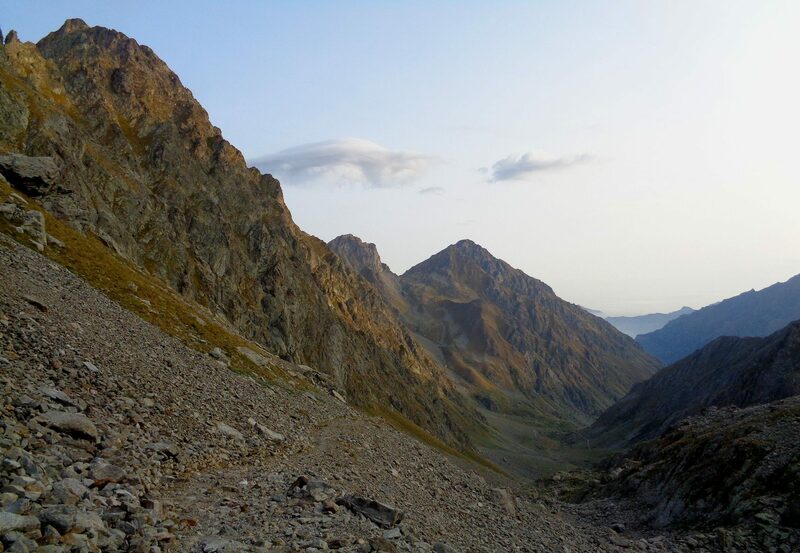 The only public road that crosses the area does so at the Col de Tende and is unpaved; there are also road and rail tunnels under that pass. 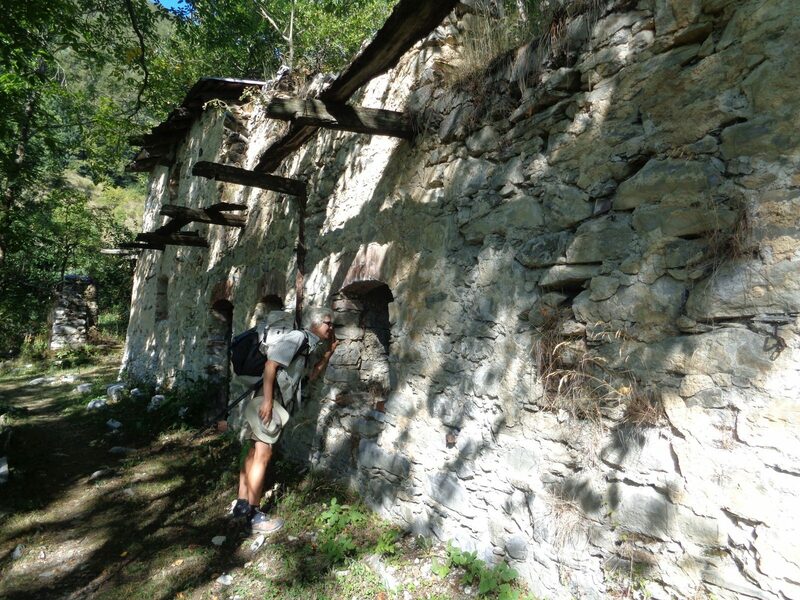 The border has numerous old military roads and fortifications falling into ruin. 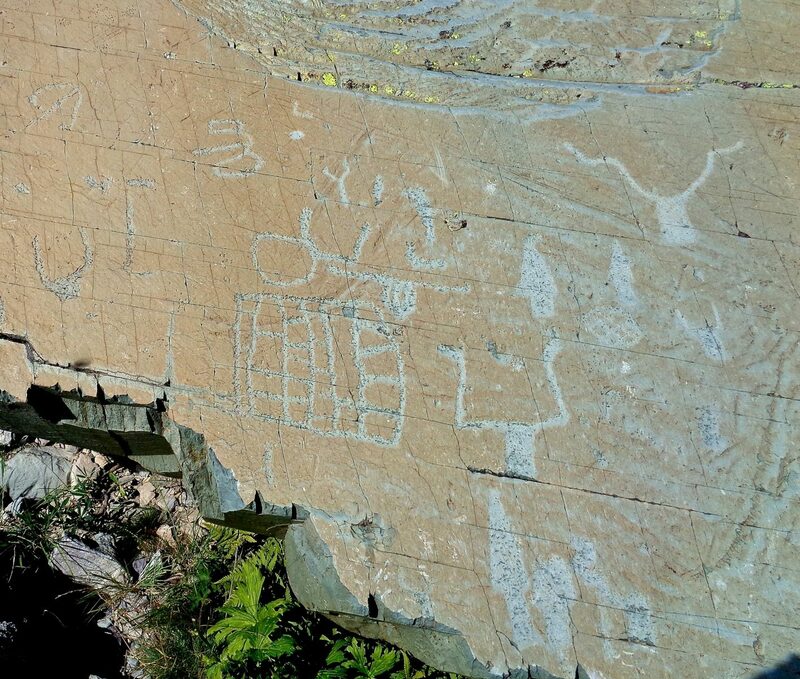 In France, we walked through the Vallée des Merveilles, an area with the highest concentration of Bronze Age petroglyphs in Europe, some of which are easily accessible from the trail. Between the GTA and our Maritime Alps hike we spent a morning hiking along the coast of the Mediterranean, from Menton, France to Monte Carlo, Monaco. This was an mildly interesting walk combining wide paved pedestrian waterfront boulevards and a fine piece of coastal trail around the Cap Martin. 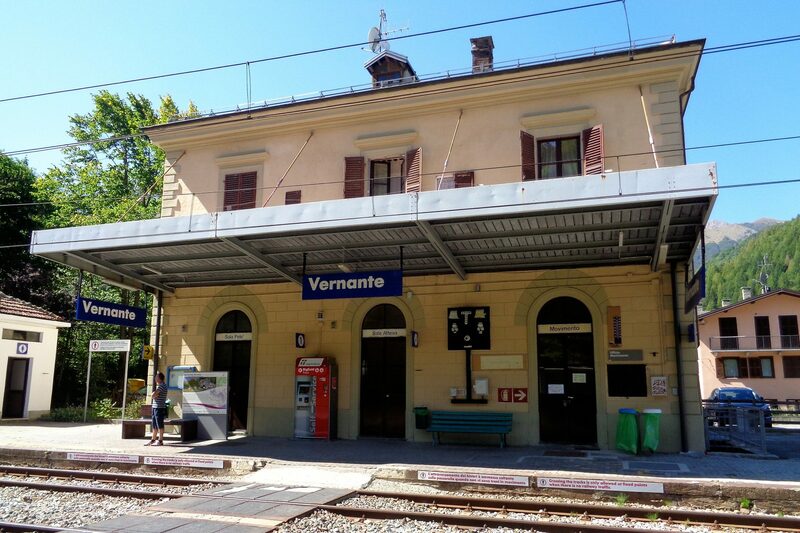 start at a train station easily accessed from Ventimiglia. finish at a train station that would provide easy access to Milan. avoid repeating sections of our GTA route. stay high in order to avoid the unpleasant lowland heat. Given our goals, our route was unique to our needs and worked very well for us. 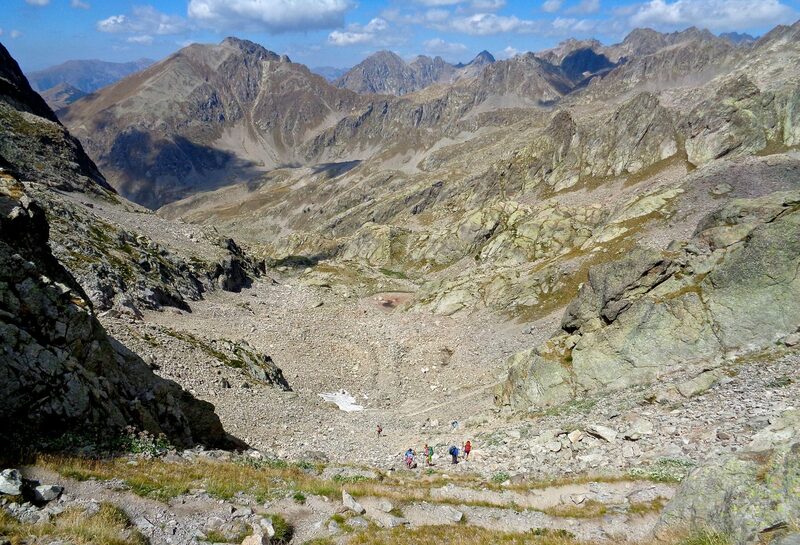 Our ability to put this trip together quickly, adapting the routing day by day as we proceeded, is an example of how easy it is to hike in the Alps. 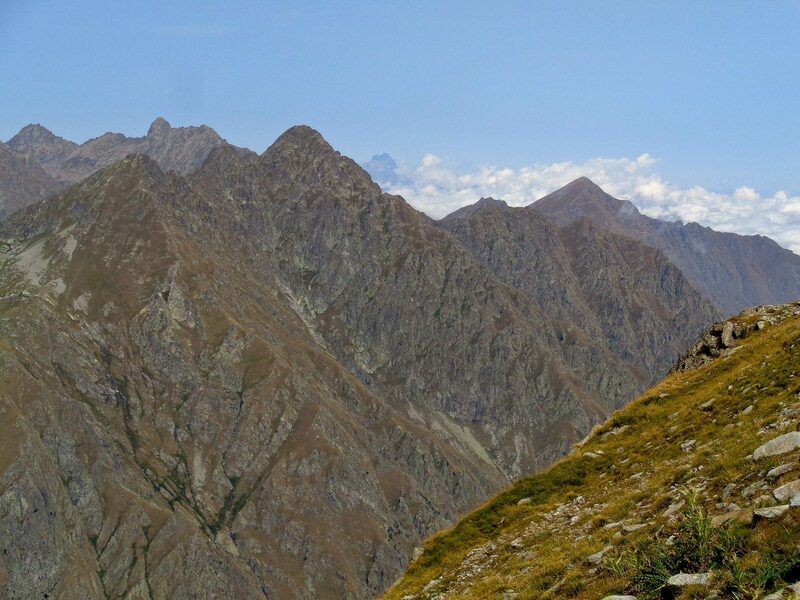 There are a plethora of trails, many refuges, and excellent bus or train service to many access points. 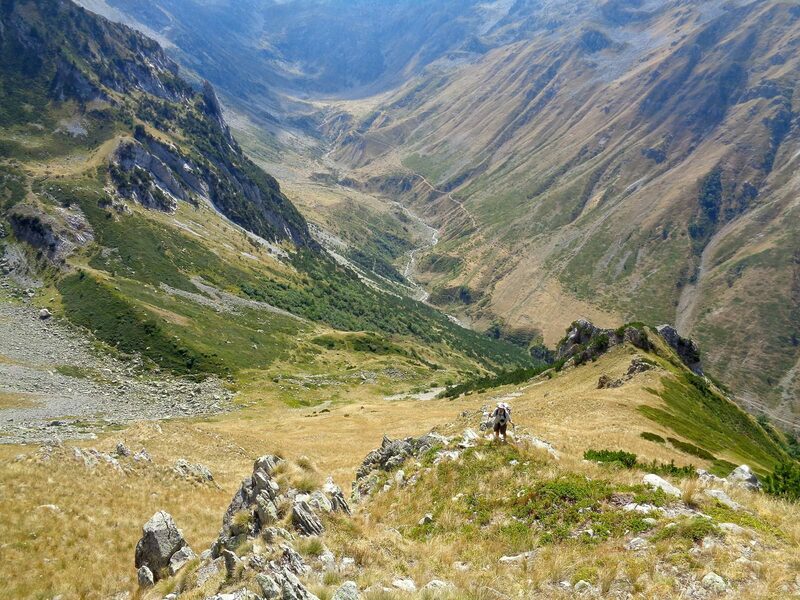 A hiker could easily arrive anywhere in Europe, take a train to some town at the base of the mountains, buy a map, and start hiking, choosing a route one day at a time. 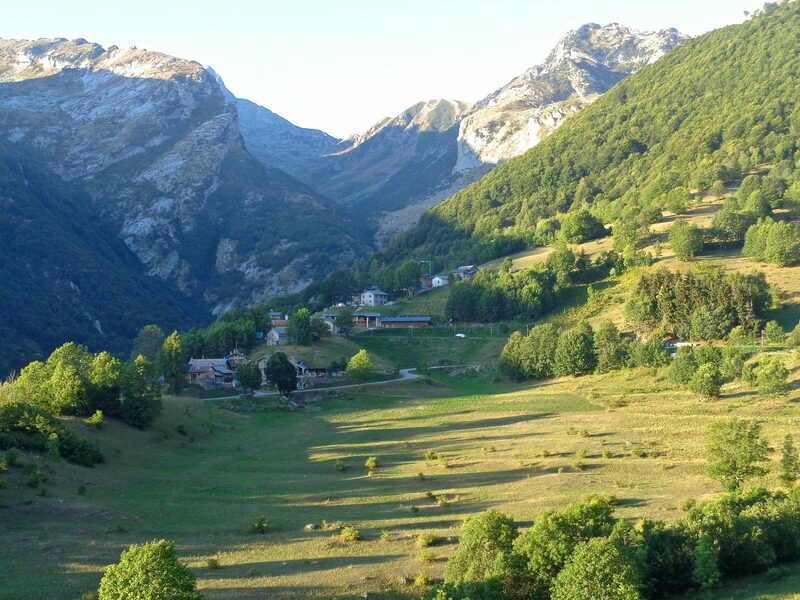 We took a train from Monte Carlo to the small town of Tende, France. 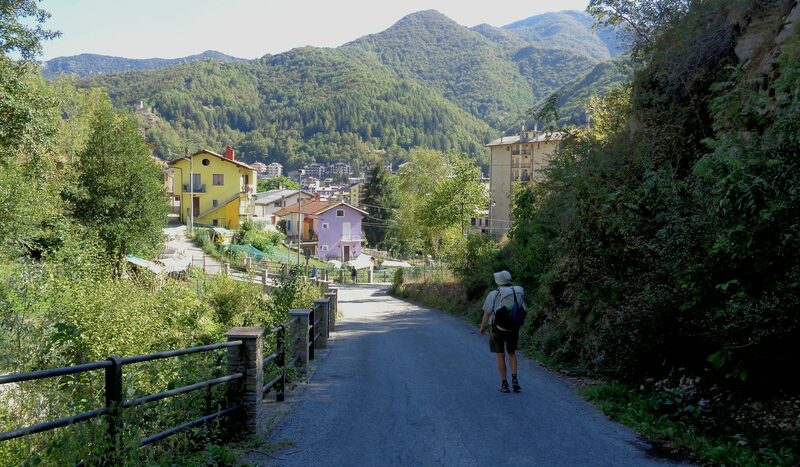 We arrived in Tende in the mid-afternoon, bought some food and a map, ate an early dinner at a restaurant, and then started walking. 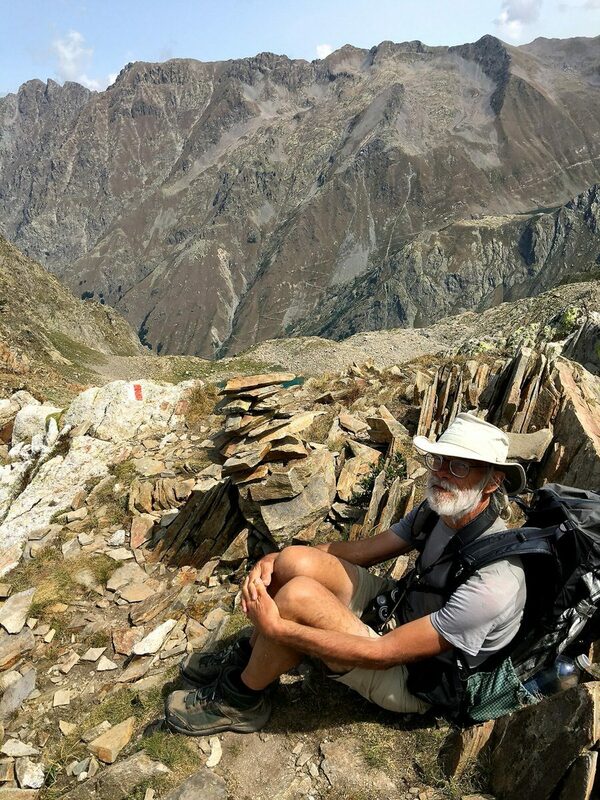 After following a convoluted path through the Maritime Alps, we descended the north side of the mountains to the Italian town of Vernante where we got a train to Cuneo for the night, and then went on to Milan the next day. 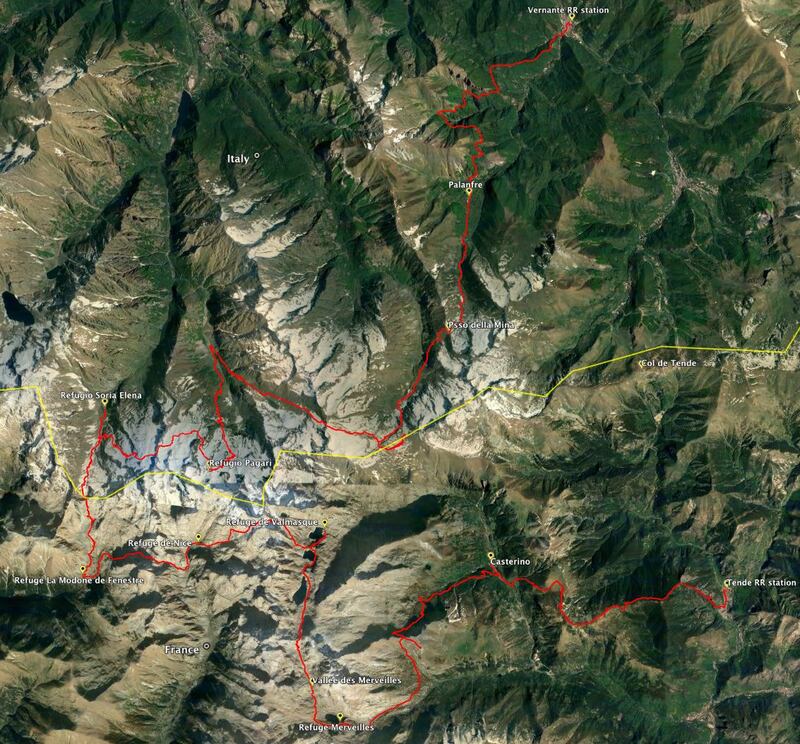 We pieced together the actual route as we went along, using the Mercantour & Alpe-Maritime map as a planning tool. We took it easy on this walk, with long stops and with a relatively slow pace compared to the GTA. 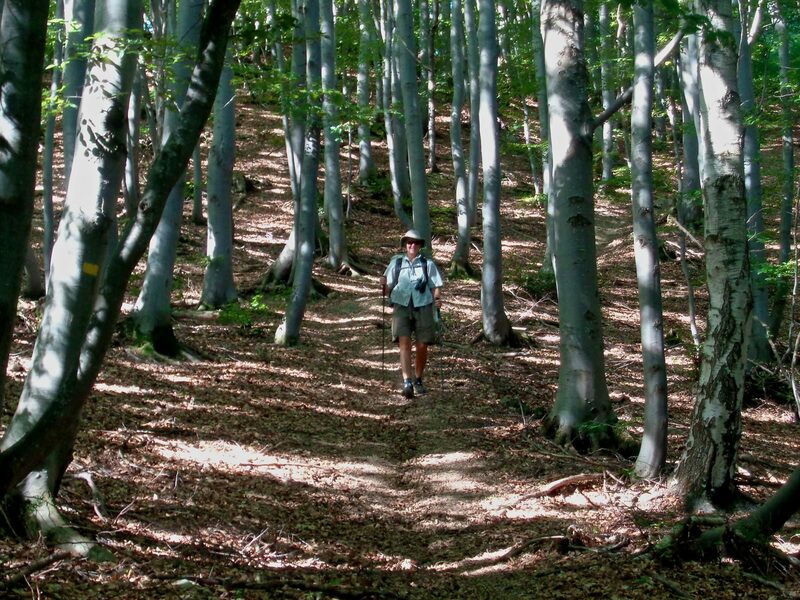 Our walk was all on trail except for crossing the Pas de la Fous and a few miles in the Valline de Sabbione. 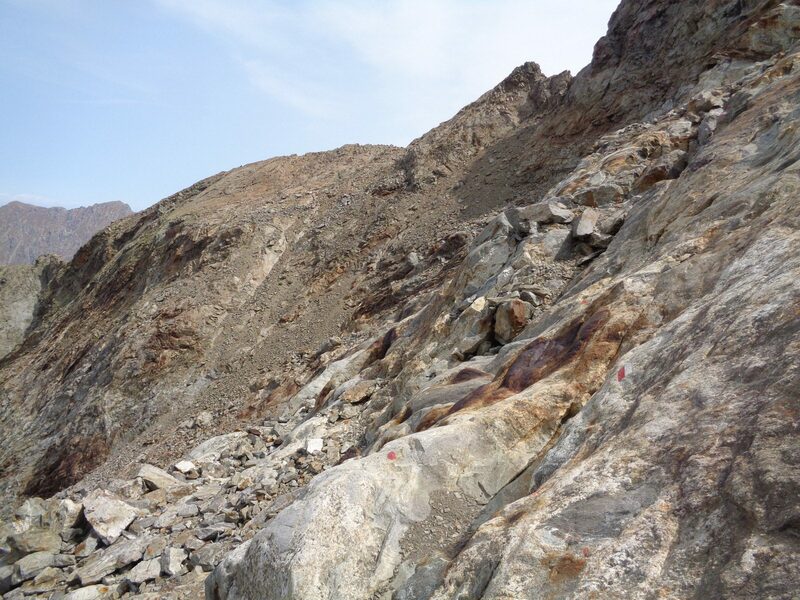 At the Pas, the old trail disappears and there is a mile or so of easy talus scrambling. 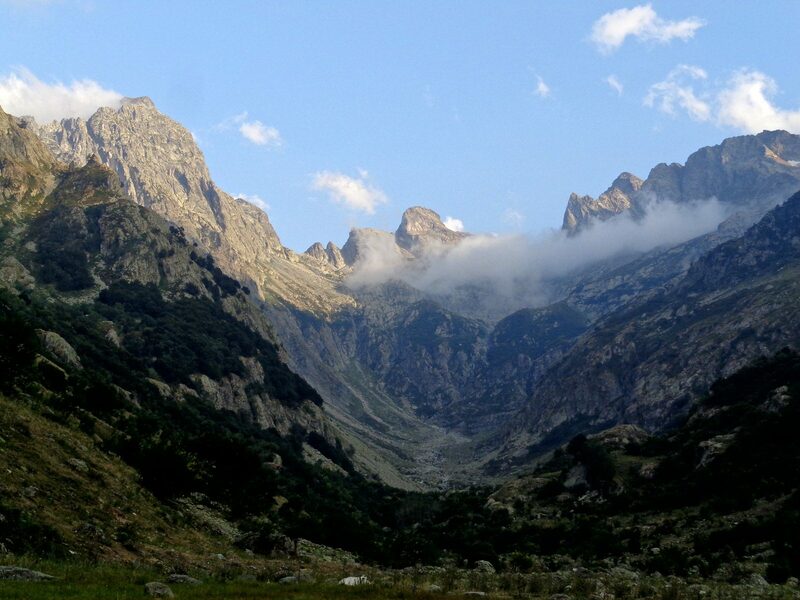 In the Valline we traveled cross-country up to Passo della Mina from the southern end of main canyon. 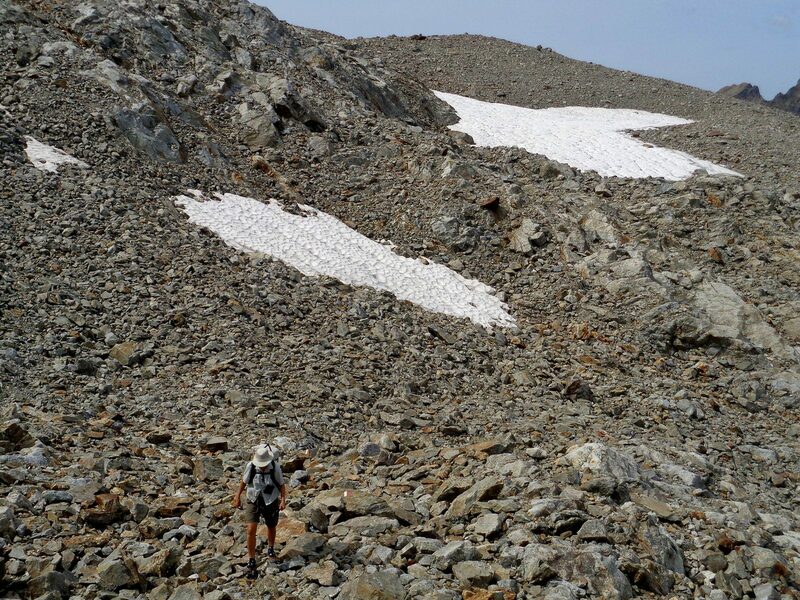 There is an old trail shown on some maps, but much of that is unused and has vanished. 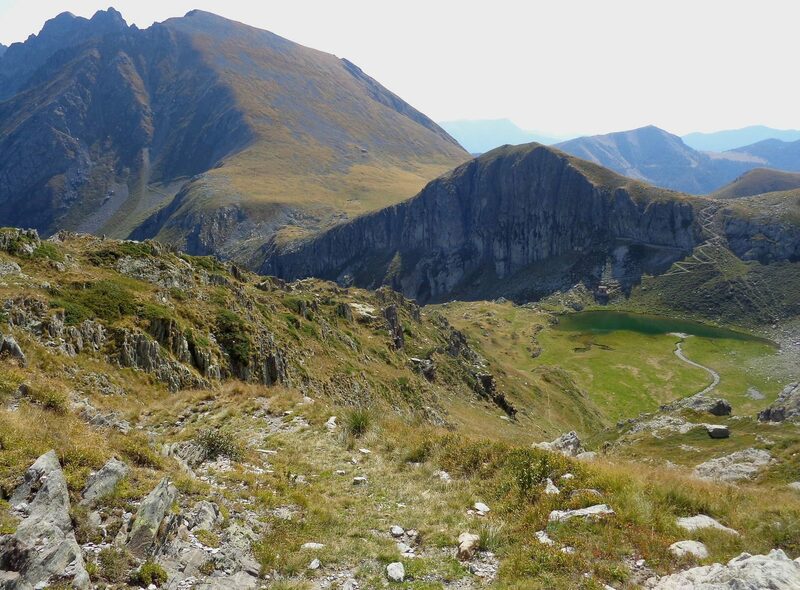 The cross-country walking was straightforward and mostly easy, but quite steep approaching the Passo from the west. 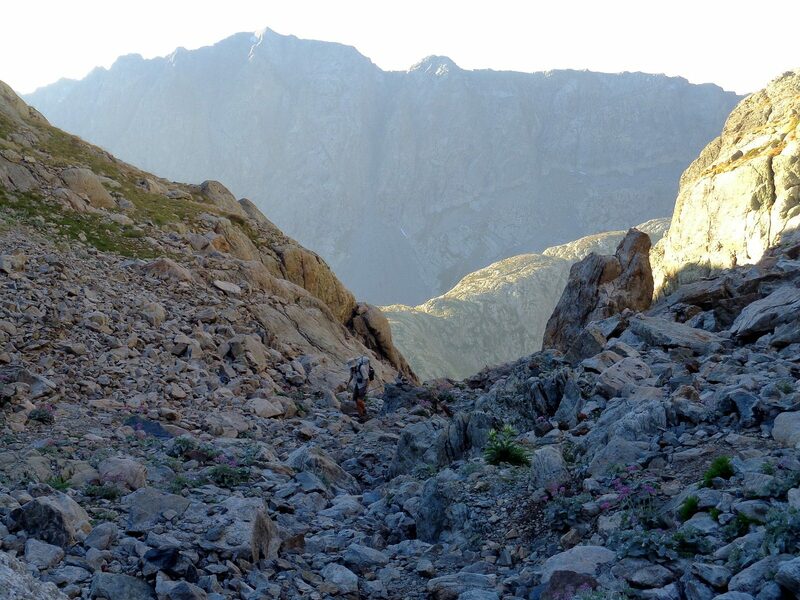 A good trail descended the eastern side of the pass. 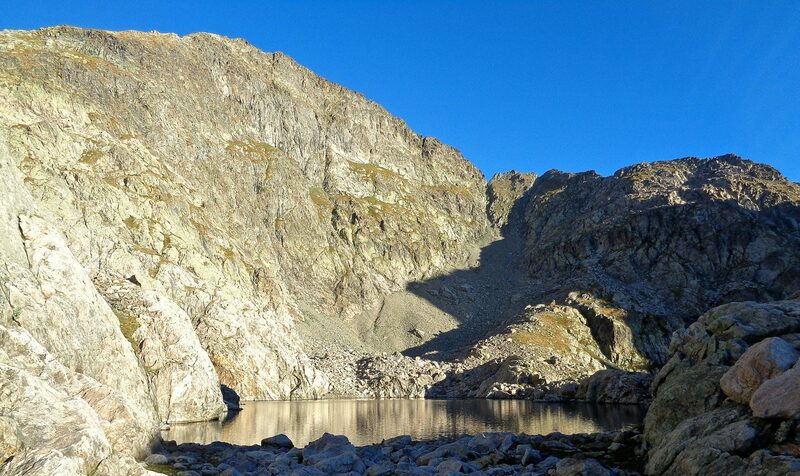 The trail between Refugio Soria Elena and Refugio Pagari was a fabulous section of walking. 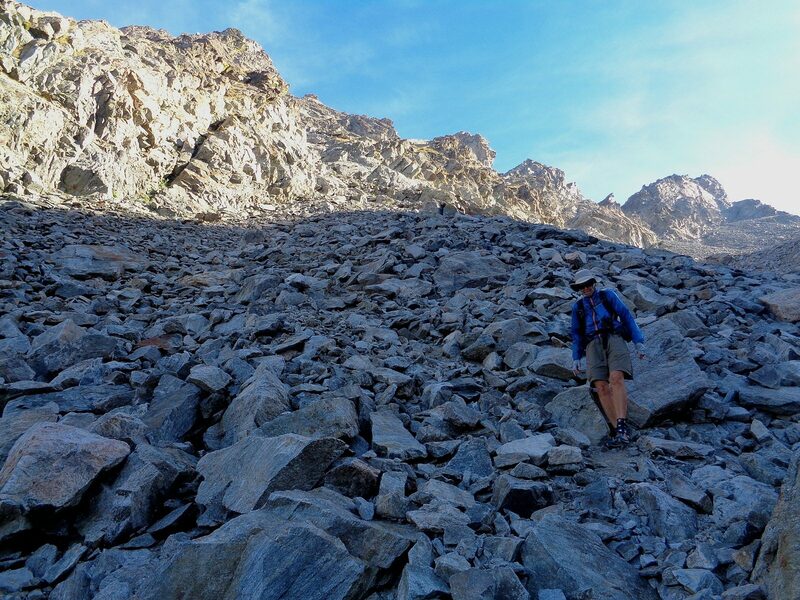 The route has a few short sections of very easy scrambling and we had to cross a small icy snowfield. 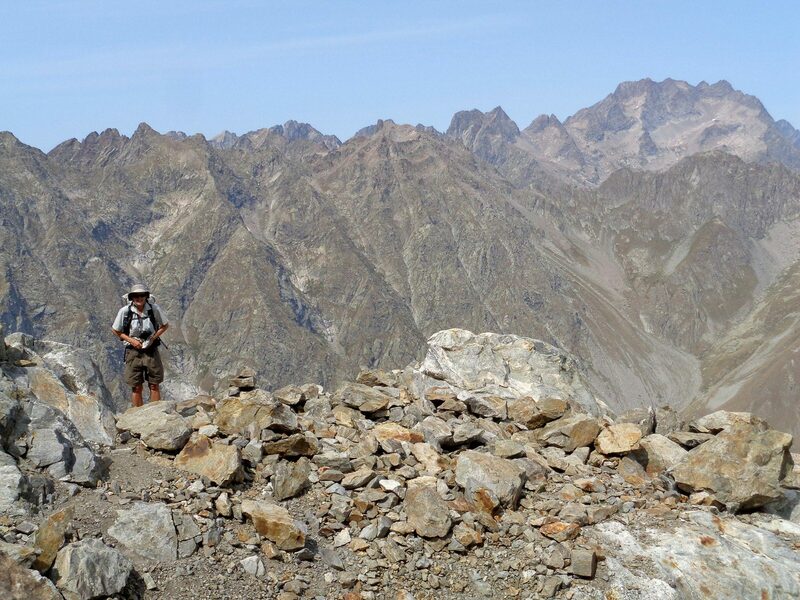 The scenery is dramatic and the trail is nicely routed to take advantage of it. 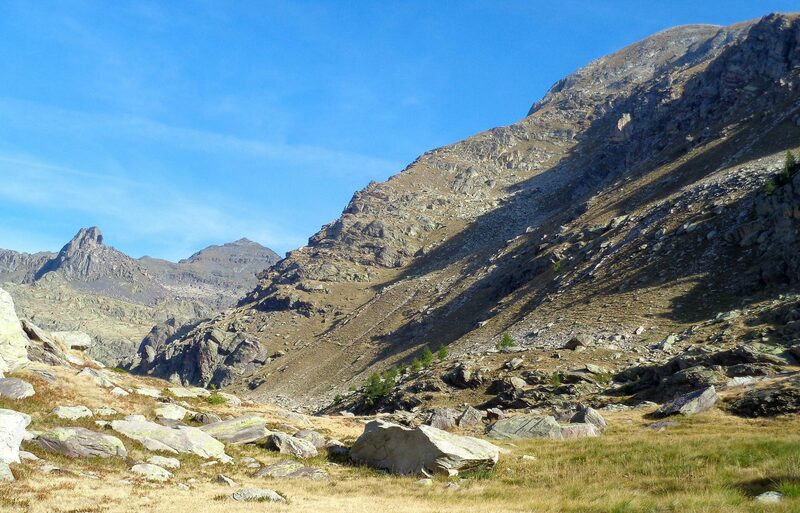 On the last morning we hiked out of the mountains on another fine piece of trail, following the way-marked La Via dî Téit from Palanfre to Vernante. 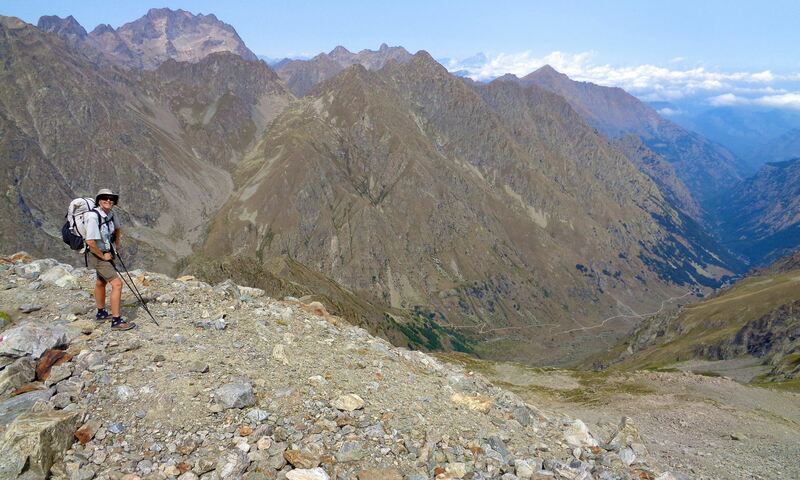 Mostly contouring, the ten-kilometer well-maintained path passed through several abandoned old settlements before dropping directly into Vernante. This final piece of easy and attractive walking was a great way to end our trip. We camped every night. 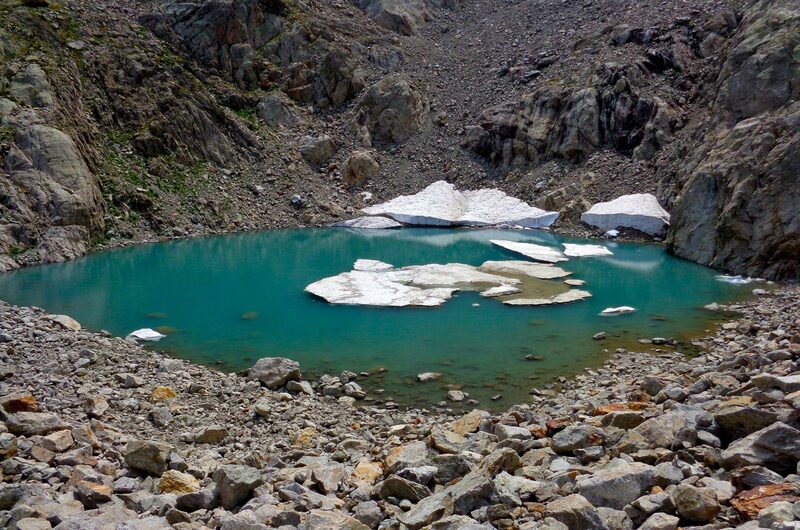 There are stringent camping restrictions in the Vallée des Merveilles: here you must camp in designated sites next to the refuges. 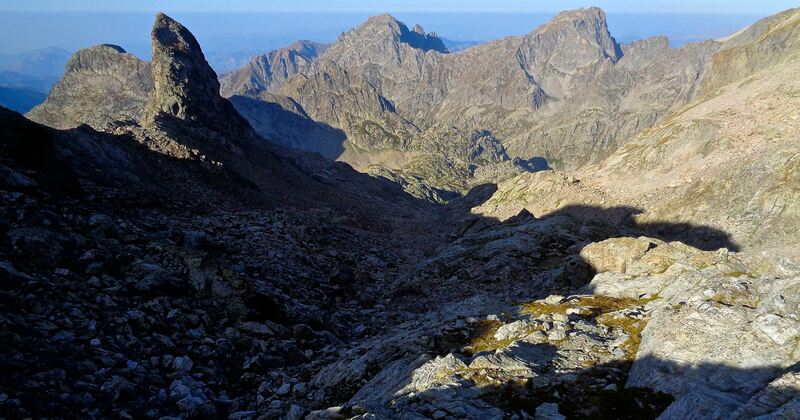 Outside of that zone, France restricts camping in the National Park to bivouacking, which means setting up after seven PM and taking down before nine AM. 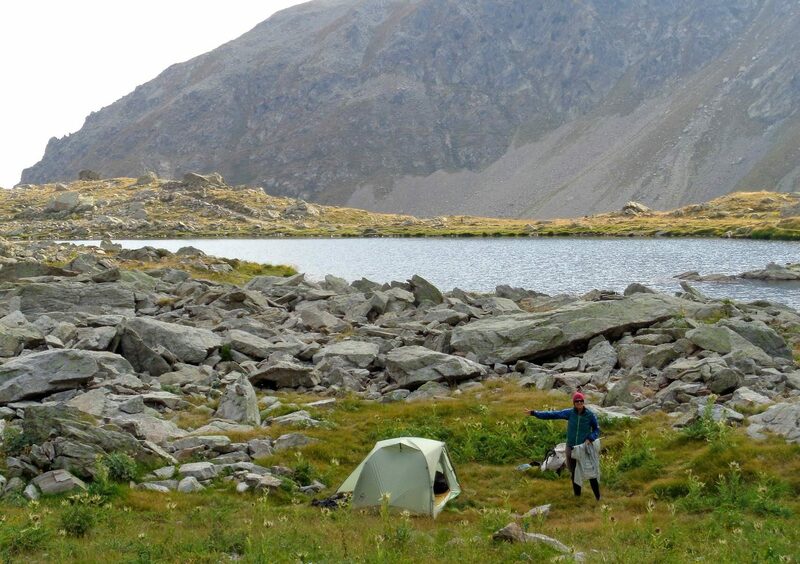 We were not aware of any particular camping restrictions in Italy. 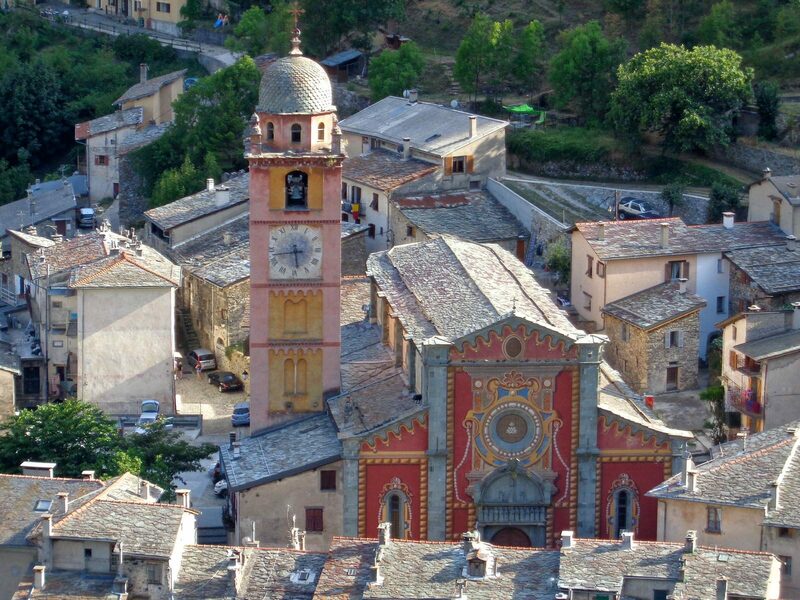 Tende has a small grocery store and some restaurants. Casterino has several cafes. We passed six refuges where we were able to obtain a few meals and some snacks. Palanfre has a Posto Tappa with a nice restaurant. Vernante has many shops and places to eat. 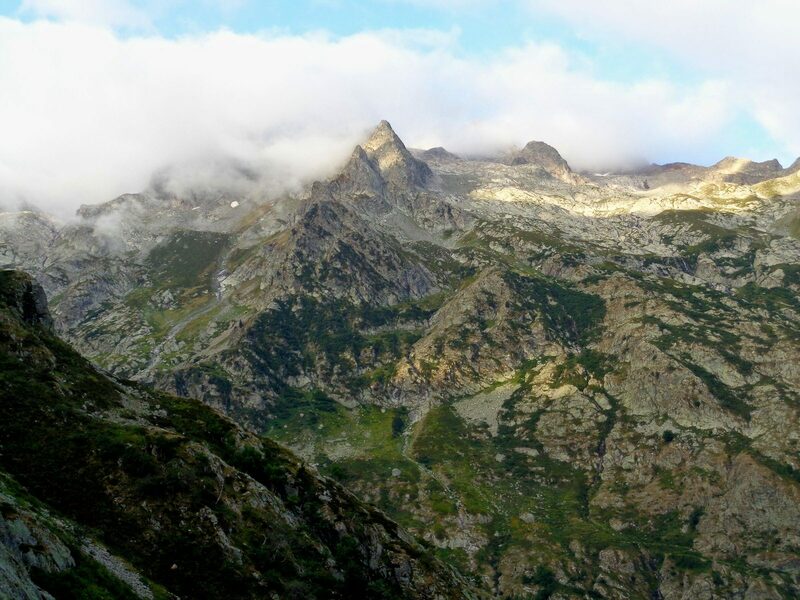 We visited two French refuges on this hike. They were more formal than the Italian ones and would only sell us tea and cake outside of posted mealtimes. The Italian refuges were more accommodating and made us hot food even though we arrived between formal meals. 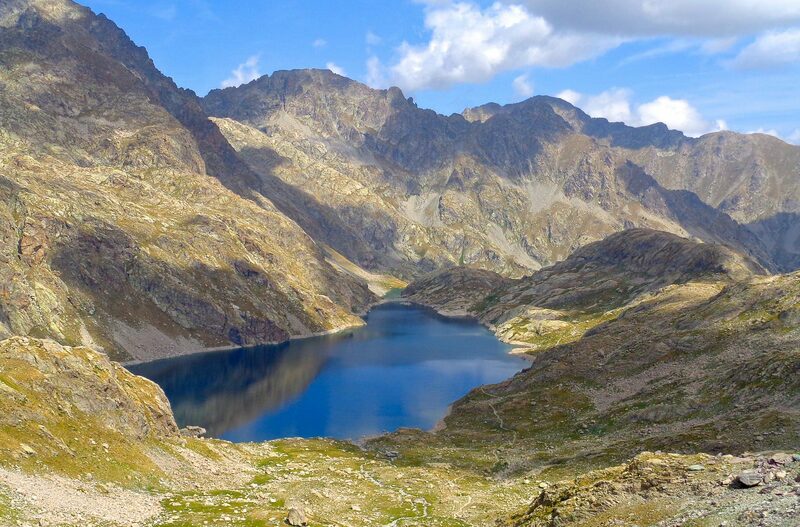 This region is a very popular hiking destination, particularly in France. 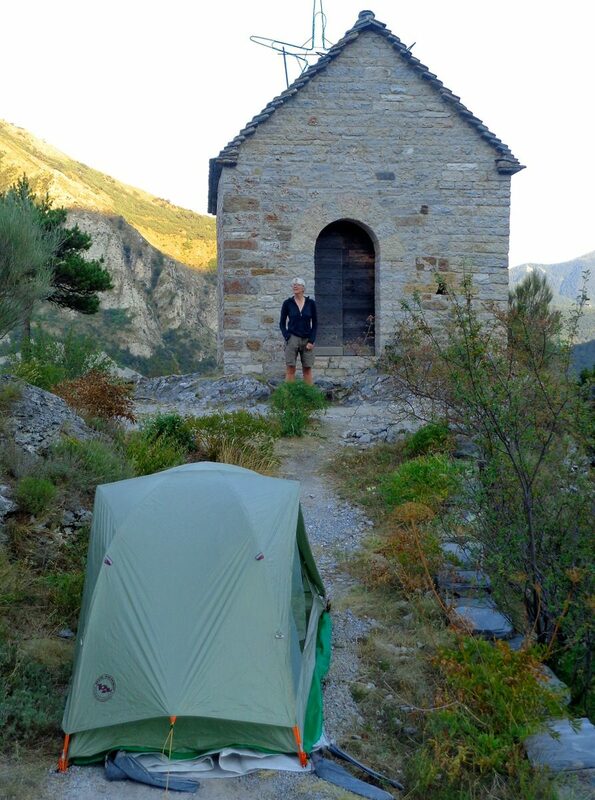 We met numerous day-hikers and a number of groups doing the loop from Castorio through the Valle de Merveilles, many of whom were using tents. 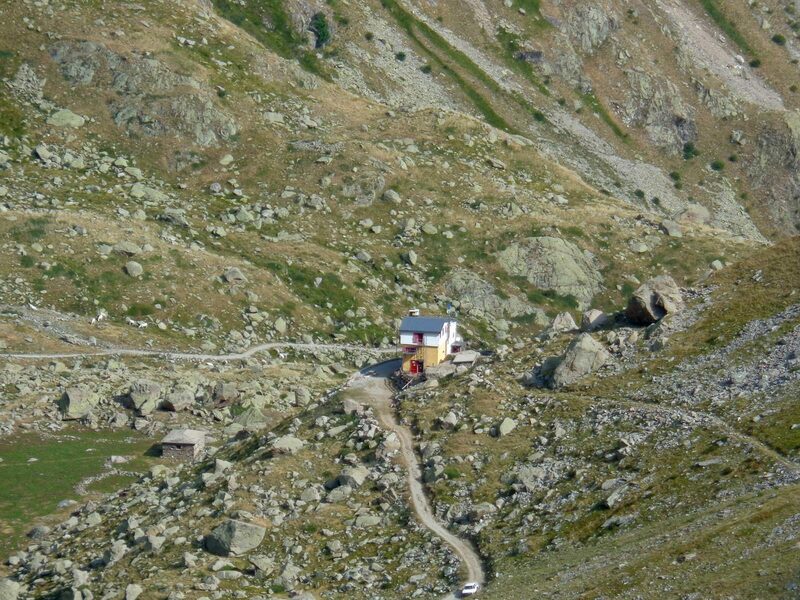 In Italy, there were quite a few people either day-hiking to or overnighting at the Refugio Pagari. We were fortunate to have pleasant weather during this walk. Low and ominous clouds threatened rain late one afternoon, but the storm never materialized. Hi, I well know this region because I live in south of france. 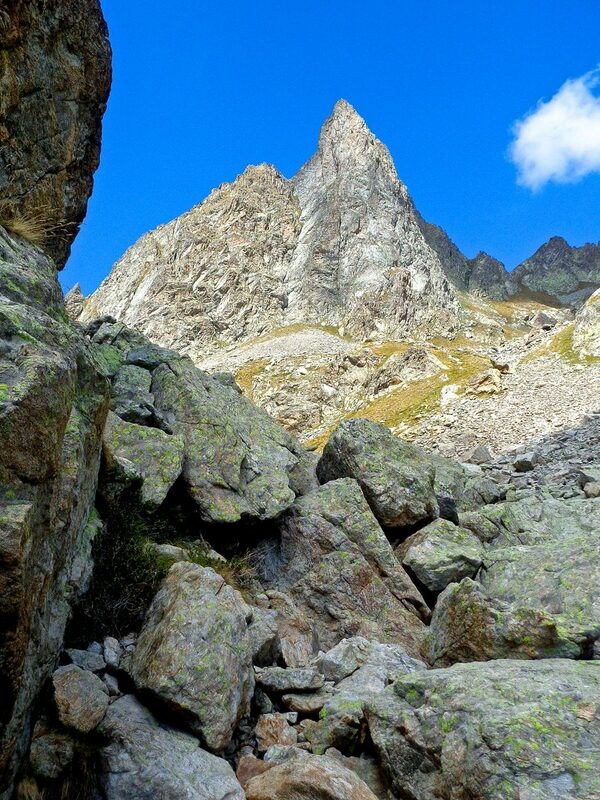 I was there on septembre for two days around Vallée des Merveilles. I’m always impressed by your adventures and how resourceful you are. Creating a path across mountains, finding a train, a station etc is not easy when you are in a foreign country. I hesitated to go on this trail, now I know it’s doable, thank you. 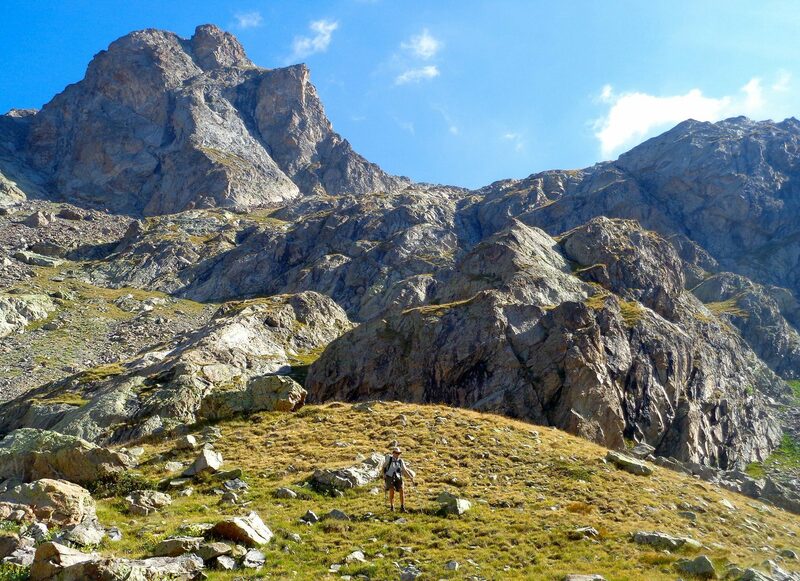 If you, or your readers, need information about trekking in France, you can see on forum https://www.randonner-leger.org/forum/ (a kind of french backpackinglight.com) It’s in french but a lot of users speak english and you can ask questions.